L’Oreal doesn’t depend on its stores to sell beauty products. It has an augmented reality app called Makeup Genius which scans a customer’s face, analyzes more than 60 characteristics, then virtually displays how various products and shade mixes can be used to achieve different looks, in real time. After selecting their look, a consumer can directly order products from inside the app. But the app isn’t just a 24/7/365 personal stylist, makeup assistant, and hairdresser all rolled into one. It also collects data on customer preferences and provides personalized information tailored to their needs. For example, if a consumer displayed interest on contouring, the app can serve up YouTube videos on the topic. L’Oreal also uses this data to build customized and consistent customer experiences across multiple channels like the website, in person store, chat, and email. This is true omnichannel, and L’Oreal is one of the few brands pulling it off. 45% of merchants have lost more than $1million in revenue due to cross channel commerce challenges, and 13% have lost more than $3million. 51% of merchants still can’t support mobile commerce, and an eye popping 80% still don’t integrate product information across the web, mobile, physical stores, and apps. 50% of merchants can’t deliver customized content across channels and platforms. In effect, businesses are losing money hand over fist because they have not been able to keep up with their consumers as they move across multiple channels and devices throughout the day. However, channel fragmentation is going to get worse, as advances in IoT, AR, VR will add more complexity. Just IoT, for instance, will have massive ramifications across customer behavior, customer engagement, and supply chain in retail. As this video by World Economic Forum shows, these changes and innovations will completely change retail experience in 2027. Brands who aren’t able to pull together data from diverse sources like web, social, mobile, sensors, chatbots, and in-store to create a hyper personal experience for their customers will head in the direction of dinosaurs. 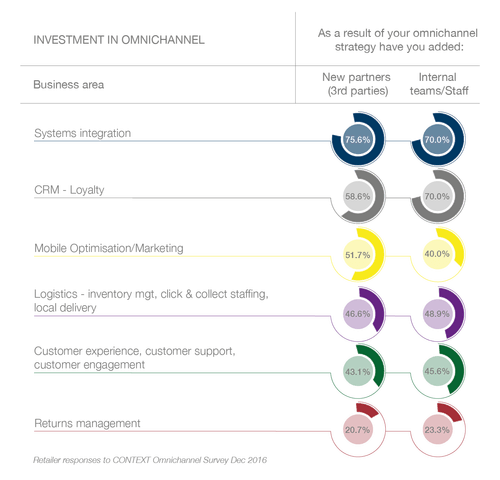 As a matter of fact, according to the CONTEXT Omnichannel Survey 2016 retailers are investing the most in system integration to link web interface with supply chains, POS systems, CRM, and logistics. …it won’t be enough just to be present across more micro-moments. We’ll all be expected to stay a step ahead of consumers—to know their needs even better than they do. Ramaswamy’s point about mobile driving the omnichannel experience is something that brands need to focus on, considering that mobile is the true omnichannel device. …they miss out on the chance of delivering quality and consistent customer experience across multiple touchpoints. Your customers and buyers will have a smartphone on or near them regardless of whether they are in a store, taking the train, watching a movie or reading a newspaper. According to this Techcrunch post, US consumers spend 5 hours per day on mobile devices. Most of that time is taken up by apps, with even TV falling behind in terms of popularity. 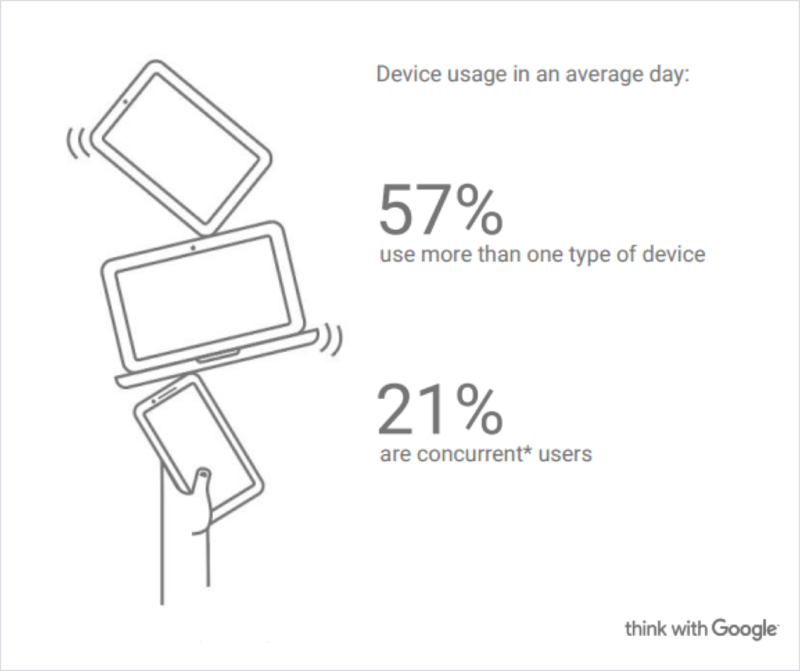 Another interesting statistic is cross device usage: according to Google, 57% people use more than one device. Complicating matters even further, people use devices differently based on the time of the day. About 21% people use multiple devices at the same time, moving to and fro from smartphone to tablet to desktop. 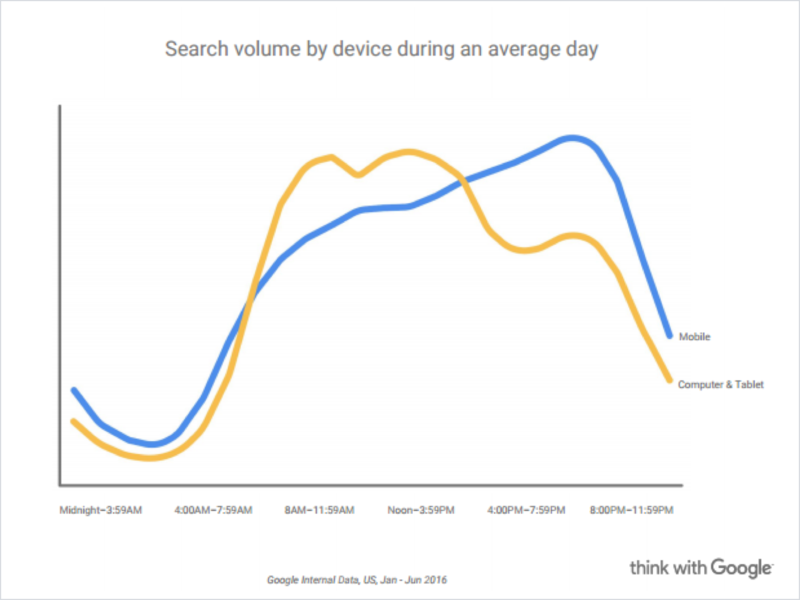 The same Google report points out that while mobile usage peaks in the morning and during post work hours, desktops drive higher traffic during work hours. 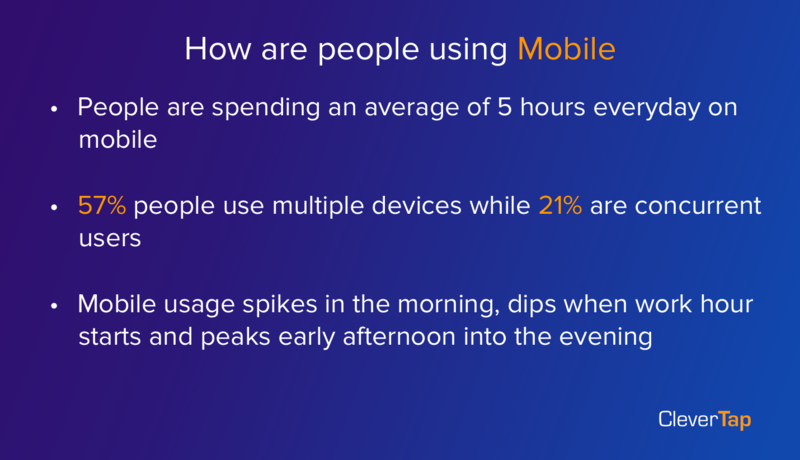 Given these statistics, you NEED to have a mobile first strategy if you want to win at omnichannel. …and if you don’t have the processes in place which tell your right hand what the left hand is doing as far as customer interaction is concerned, your business will hurtle towards oblivion. In this context, Nike’s experiments in blending real world experiences with digital and mobile across multiple platforms can be instructive. Find out how to take your omnichannel game to the next level by automatically sending hyper targeted messages to your customers based on their real time actions. Omnichannel success hinges on how well you can break down the internal organizational silos and build a vertically integrated back-end and customer facing front-end. This video shows how Nike is using multiple channels to create a truly omnichannel experience in its stores. Nike integrates their digital properties with physical stores, making it easy to find out information about a particular shoe online. Nike takes advantage of showrooming by offering an exclusive line of shoes which while displayed in the store can only be bought online using the NikeID program. You can buy a Nike product online and pick it up at a store. You can also buy in-store, and get it delivered home, or order something and pick it up from another store. Staff uses handheld POS systems to accept payments, process returns, and arrange home delivery without making customers queue up at the entrance. Nike can use the data collected in-store, online and on mobile to make the shopping experience even more personalized. For example, if you bought a pair of football shoes from the store, Nike can email you a discount coupon for football jerseys a day later, or send you a mobile push notification for the same. With omnichannel shoppers spending 50%-300% more than single channel shoppers, Nike’s revenue per customer increase. And with another study finding out that 26% consumers are actively seeking personalized offers, Nike gets more loyal customers who would return to buy more over time. Successful omnichannel is win-win for both customers and brands. While Nike has invested millions in creating this omnichannel experience, you can replicate much of the same experience by using an analytics and engagement platform like Clevertap. Half the battle is won when you know, at a deep level, each and every interaction your user has with your brand across mobile and web. Data about purchase history, the total amount spent, depth of engagement, the frequency of visits can help you look at your users like the individuals they are instead of treating them like numbers on a spreadsheet. As a bonus, connecting with their publicly available Facebook and other social media profiles can give you better insight into their personality, making your targeting even more effective. 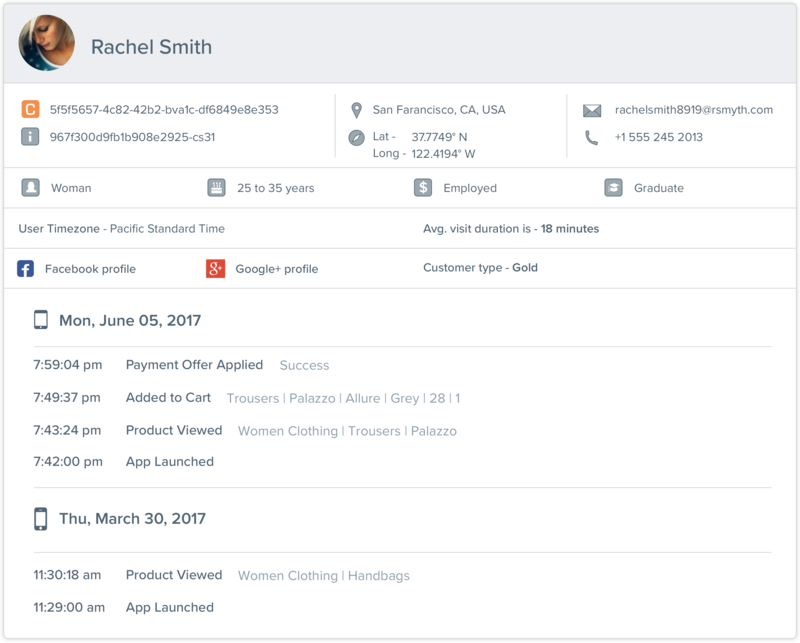 When you are building customer profiles, don’t hesitate to ask information like phone numbers or Facebook profile details. While you might think that users might not want to share information because of privacy concerns, GSMA data says that 66% consumers are ok parting with private data as long as you are upfront about how it will be used. You need to be able to follow users as they move across multiple devices and platforms. For instance, when your customer moves from the desktop to mobile browser to an app you want your system to understand that it’s a single person instead of three different people. When you have an accurate tracking system in place you will be able to understand which channels are outperforming and which channels are falling behind. With those insights, you can invest more marketing dollars in the high performing channels, or figure out how to fix the broken channels. You should also be able to track your users in real time across different segments so that you know what exactly are people doing on your app. Once you start to understand your users you can start sending them personalized messages based on previous, and even real time behavior. 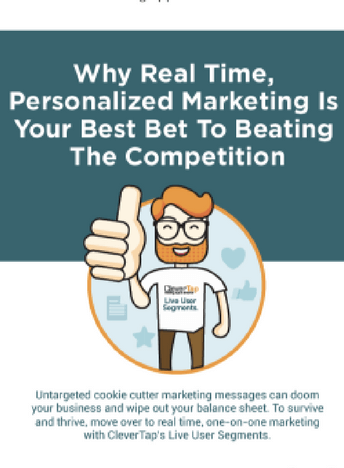 Because you already know their device preferences, their likes and dislikes, and their past and current behavior you don’t have to send multiple messages across different channels, annoy the customer by repeating the message over and over again or send messages at weird times. If you have real time activity insights, you can also send timely messages that would have a higher chance of being acted upon: for example, if a user doesn’t complete the cart checkout process on the mobile app you can send a timely push notification. A customer is looking for international tickets on a travel portal. They might add particular tickets to the cart, but before checking out might hop over to another tab to do some research or compare prices. And just like that, the chances of the customer completing the purchase comes down significantly. What if the would-be traveler gets a call from the travel portal’s call center 10 minutes after a ticket has been selected? A customer service executive can clear doubts, answer questions and even warn them about an impending increase in rate. The customer would be more likely to complete the purchase. This is one of the examples of a webhook in action, where one system automatically sends an alert to another system based on preset conditions. Webhooks are key to brands delivering a truly omnichannel experience as they let two different systems talk to each other at the right time and under the right conditions. 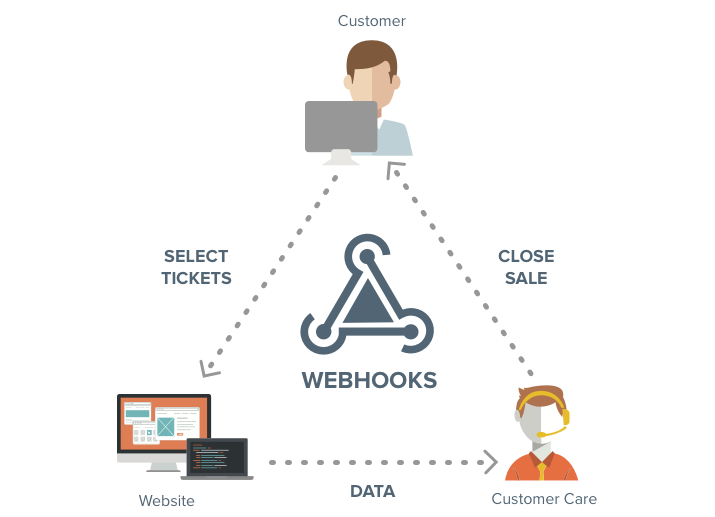 With webhooks a POS system in a store can offer a loyalty discount to a customer who is a frequent online buyer. An online search about omnichannel will throw up a large number of articles related to retailers. However, omnichannel is less about retail and more about adapting to changing customer behavior. Therefore, you will still have to implement an omnichannel strategy if you are a retail bank, a hospital, a hotel or a B2B company. The principles remain the same: knowing your customer journey, keeping messaging timely and relevant, and adding a feedback loop so that you can improve during subsequent iterations. What’s your biggest challenge with omnichannel marketing?